I am a klutz. Major klutz. I fall a lot. Last year I documented that I fell when Price and I went to the Highline in NYC. 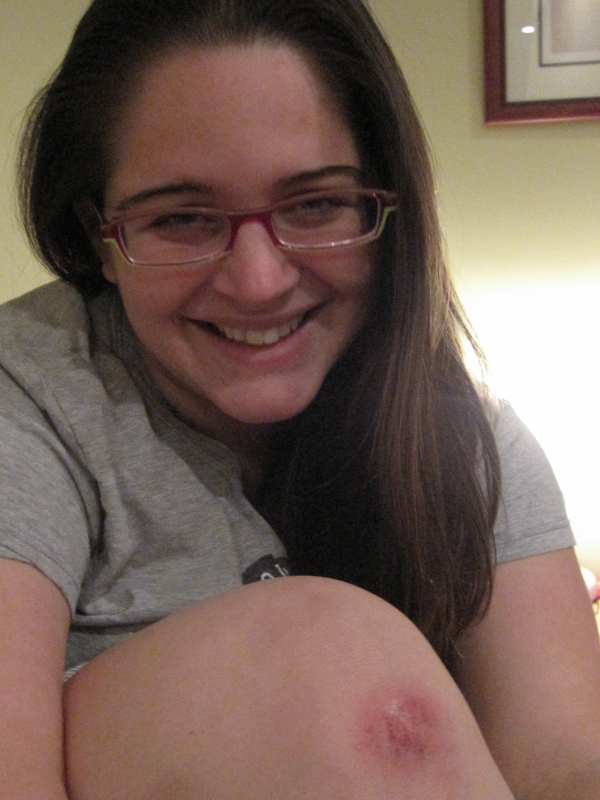 I always have wiped out on the hardwood floor, on our bedroom rug, at my mom’s birthday, etc. All of that was last year. Well I did it again yesterday! I was meeting Price for lunch yesterday so here I am walking to him and catch my heel on the bricks of the freedom trail and 1-2-3 fall on my right knee. I went smashing down right in front of a cemetary full of tourists…umm not embarrassing at all! Price got me up and I insisted on continuing on instead of going back to my office to switch into my sneakers and clean up my leg. Once we were ordered our lunch I checked on my knee. See I was wearing black footless tights that magically did not tear when I fell, so I did not see that I was actually bleeding pretty badly at that point. I have skills.